The second of three drinks manifests from Melissa’s neutral, creme and floral printed, daring, two piece. I love how versatile it is! Whether it’s both pieces together or one statement piece transitioning from day to night, it was one of my favorite looks and inspired me to make the drink exactly that. Multi-faceted. The Re-in-carnation is a mint julep inspired cocktail, that you can sip on under the spring sun or serve up for friends during a night cap. Light sweet notes of peaches and the rich oaky flavor of Jamison, with the cooling refresher of ginger beer and mint, this drink represents the perfect balance for any situation. Here’s how its made. 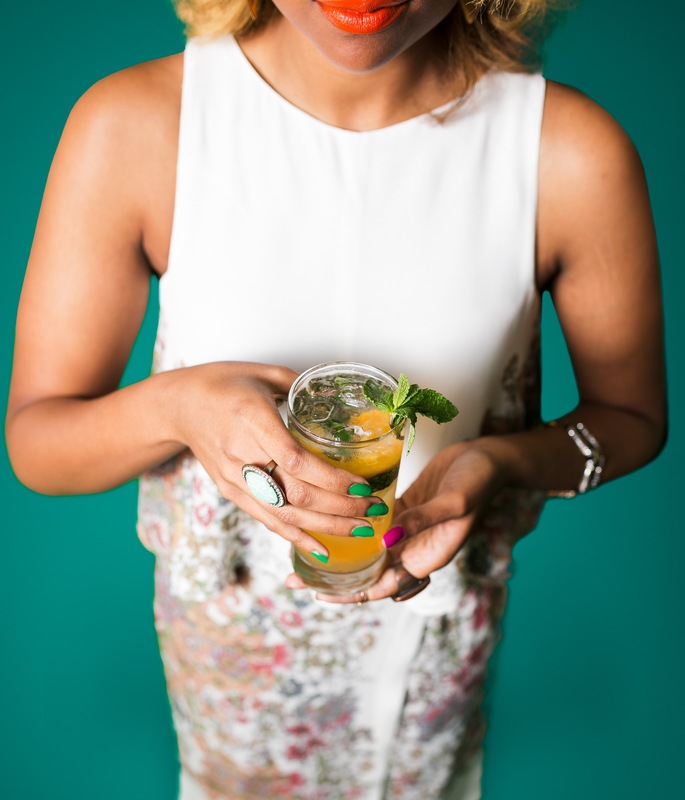 In an empty shaker, place 4-6 mint leaves 1/2oz triple sec and 3 peach slices and muddle for flavor. Add 2 oz of Jamison. Pour into an ice filled Collins or Pub glass, stir with a spoon or straw and top off with ginger beer (served as a mint julep). To check out more of Melissa’s chic 70’s style in this go-to spring/ summer outfit, head over to LiveClothesMinded to see more! Plus don’t you live this lipstick? !